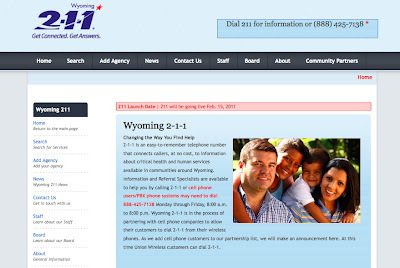 We are pleased to announce that the good folks in Wyoming have launched their 2-1-1 state wide system using VisionLink's CommunityOS solution. You can visit their site at: http://www.wyoming211.org, or by phone at 888-425-7138. We are very pleased to support another statewide 2-1-1 initiative. Particularly during these tough economic times, 2-1-1 is an unusually effective and efficient method to connect needs with helpful resources. And these days, any disconnect between needs and resources turns issues into problems, and problems into crises. We will also be launching another new 2-1-1 system across much of Pennsylvania in the near future. Stay tuned for updates!